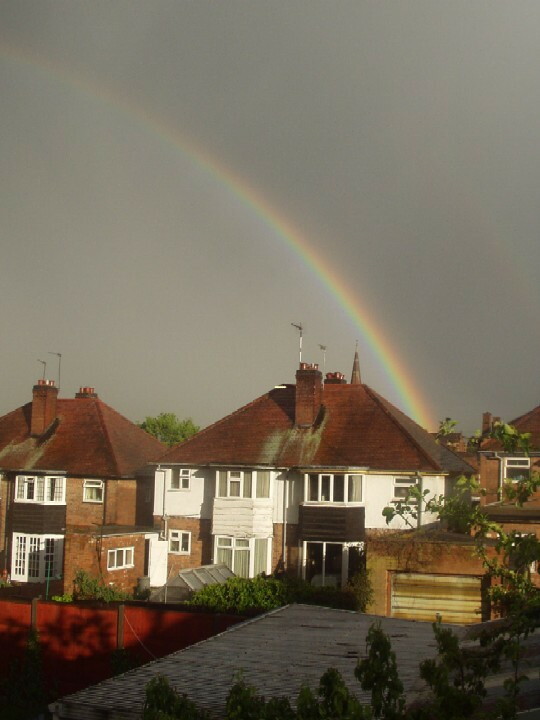 There was a double rainbow at one point! I tried to get a picture, but it didn't really come out very well. I know – wasn't it fantastic? That photo was supposed to be of the double rainbow too… but the second ring just seemed to vanish whenever I tried to get it in shot. Eventually I got tired of balancing on my windowsill and getting odd looks from the neighbours, and admitted defeat. One of my friends kept leaving food under her bed and eventually it turned into this monster thing that she kept feeding. It got bigger and bigger and after a few weeks crawled out, ate her and took on her guise. Thinking about it, this may have been a film. hm. that would depend entirely on which sigur ros album it was. I wish I lived in that film. I think being possessed by the spirit of a rotting banana would probably qualify me for 'special considerations' in my exams, for which I haven't done enough revision. And yes, it is getting to the stage where I am that desperate. And Leni, it was '( )' I don't know where that ranks with you, but I love it. It does mean I have now had an attack of Sigur Ros syndrome and seem to do nothing but wander round continually going 'yuh xylohhhh.' Will try to contain it by Tuesday.